Confession: there’s more than 5 rifle case options here. It’s more like 5 different categories with 2 options in each category. What can I say, I like giving people options. So here are some great options to keep your valuable boom sticks safe no matter where you’re going. NOTE: all links lead to Amazon.com. Some of the cases “require” (but don’t really require) Amazon Prime. You can either take the Free Amazon Prime Trial and cancel before you need to pay, (recommended) or look on the right side near the top and they are available from Amazon through other vendors. Sometimes, all you need is a good cheap case to tote your rifles in. Something that doesn’t break the bank because you might need a bunch of them. There are many options, and here are two good ones that won’t make your wallet complain. Black Rifle fans, (that’s AR-15 guys if you didn’t know) these are the cases your rifles live in. These cases usually have storage for extra magazines and are sized to fit an AR-15’s tall body, even when you have a scope riding on top. These are excellent for storing your trunk gun to comply with travel laws. Plus, the storage for extra magazines will come in handy if the “Stuff” ever hits the Fan while driving around. Also, the extra pockets come in handy to store all those little goodies for a range trip. Okay, I don’t like hiding my love of guns either. But there are times when discretion is the better part of valor. Anti-gun neighbors, suspicious stares, and a general desire to “live and let live” sometimes push me to carry my rifle discreetly. 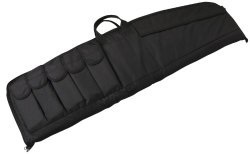 If you have the same desire occasionally, then a disguised rifle case can help you travel incognito. Plus, it’s cool to carry a rifle around when everyone thinks it something else. 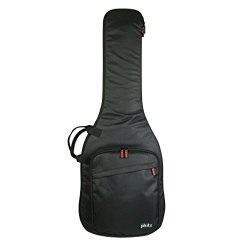 A great option is an electric Guitar case. It’s not a Tommy gun in a violin case, but they are pretty cheap, can hide large rifles (even with a scope) and people won’t think twice about a guy carrying a guitar case. They’re perfect for moving long guns without anyone getting their undies in a bunch. 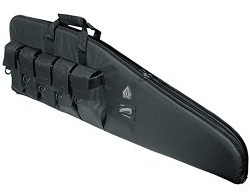 On a more serious note, combo range bag rifle cases are good for more than just enslaving Middle Earth. They can hold multiple rifles, shotguns and/or pistols, plus plenty of other goodies. They cost (and weigh) a bit more, but they’re a LOT more versatile. Lets face it, sometimes life can be rough. 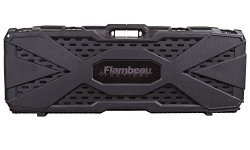 Soft cases are great for size, weight and price; but sometimes you need a little more. A case that can take a licking and keep on ticking. That’s where Hard rifle cases absolutely shine. 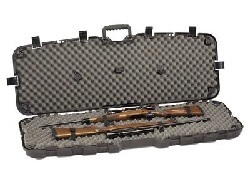 A good, tough & sturdy hard case can keep your rifle safe from the harshest of falls and bumps. They are ideal for any situation where rough handling is expected. 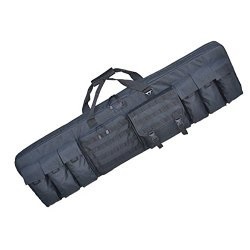 …And that’s it for rifle cases. I do have many more great articles on my home page though. Enjoy!